At the bottom of the ark, you can see waves splashing against the hull. 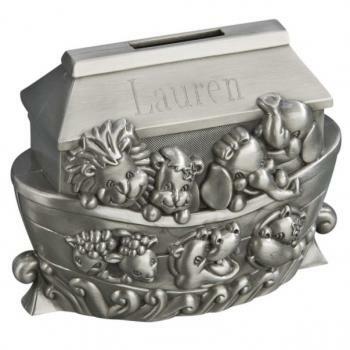 This bank is produced in a non-tarnish brushed pewter finish. The coin slot is on the very top of the Ark's roof. This version of the ark has a 3.5" x .5" smooth area on the roof on each side that is perfect for any engraving.